I’ve been keeping written journals since I got my first diary for my 9th birthday. I started keeping a visual design journal last year when I won this sketchbook from Kathleen Lange Klik of Modern Nature Studio. Janice Lowry’s visual to-do list, from Lists, by Liza Kirwin. I had a decision to make this summer when the pages of that first sketchbook were nearly full and it was time to move on to another one. Intrigued by a recent exhibit I visited on book arts, I decided to sign up for Deryn Mentock’s Artisan Daybook online class and create one myself from vintage book covers and drawing, printmaking and watercolor papers. Deryn shared so many design techniques in this class – altering cabinet cards, creating wire forms and collaging were just a few we used on the cover. I found my cabinet card tucked away in a shoebox in an antique store. I loved the fact that the girl was in profile, and just look at that hand muff! The photography studio imprint shows the photo was taken in Cincinnati, and the inscription on the back reads, in impeccable penmanship, “A Merry Christmas from Sister Clara, 1890.” Could Clara have ever envisioned another woman, 125 years later, giving her portrait a second life with watercolors and layers of stampings? Sari silk and a piece of tatting given to me by my husband’s grandmother nearly 30 years ago are wire wrapped around sticks from my backyard. Isn’t that the cutest flower? I have a feeling these wire forms Deryn taught us will be finding their way into my jewelry pieces! The pages of my first sketchbook were filled up chronologically. I can still flip to a particular design pretty easily - amazing how our designs are like offspring and we can remember them in birth order! But for my new journal, I created individual signatures for notes, earrings, bracelets, neckwear and color ideas. The first section in my journal will be for gathering colors and patterns into palettes. Deryn’s class included several fun transfer techniques. For the cover of my first signature, I printed an avatar of my Dream Client onto a transparency and transferred her onto a watercolor and gelato background. The only art supplies I had at the beginning of this project were a beautiful set of colored pencils Kathleen gifted me with my original sketchbook. I became a frequenter of the $3 and $5 sales tables at my local Sam Flax art store! The workshop gave us lots of techniques to make the inside pages as unique and interesting as our covers. Adding a small envelope with tissue tape gave me a good place to capture artist cards from our recent trip to the Arts District in Asheville. A collaged envelope is the final signature in my journal. Empty when this photo was taken, it’s now stitched into the spine and brimming with ideas I need to transfer onto the pages of my journal! I highly recommend putting Deryn Mentock’s class schedule on your watch list. Deryn’s joy and enthusiasm for the creative process are infectious, and this workshop, besides being totally fun and inspiring, was the highlight of my summer sabbatical. what a wonderful book! and can only imagine the creativity flowing from the pages here ... with all that comes out in your work!! I've only just started to journal my designs. But this is quite an inspiring post! What a fantastic sketch/journal book! I have several artist journal making books and would love to create one myself when time permits (it will be awhile). ;) I am so happy that you got good use out of the sketchbook that you won from me! Thanks for inspiring us! 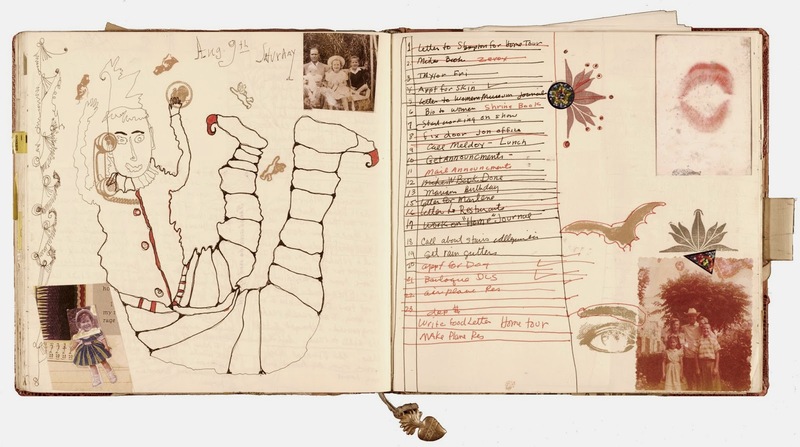 There is so much creativity going on here and in the pages of the journal, but the journal itself took my breath away. The details are wonderful! And looking at the cover, the on-looker just knows there is greatness brewing inside!